"Glamour and glitter, fashion and fame…"
Jem and her Holograms, in the flesh? Many girls who were preteens in the mid-1980s (like me; yes I'm old) will remember those lyrics and the line that came after: "Jem! Jem is truly outrageous! Truly, truly, truly outrageous!" Who didn't want to be a part of Jem and the Holograms or their evil nemesis band, The Misfits? I myself had to be Jem since I was named Jenn, after all, and it was close enough for me. I wanted those cool red starburst earrings with the digital connection to Synergy, the computer-based being who helps Jerrica Benton and her friends morph visually into Jem and the Holograms via—you guessed it—hologram technology. There have been rumors about a Jem movie for a while now, and those were confirmed on March 20. Apparently the success of other toys-turned-films (G.I. Joe, Transformers) has inspired Hasbro to continue the trend, this time with a more female-centric brand. This week we have news that the title character and her band of hot chicks with cool hair have been cast. The actress in the title role is Aubrey Peeples, who has also appeared in the cinematic classic Sharknado and the television show Nashville. Her bandmates and friends will be played by Stefanie Scott (of Disney's A.N.T. Farm), Aurora Perrineau (from Pretty Little Liars), and Hayley Kiyoko (from Lemonade Mouth). The film is to be directed by Jon M. Chu (who directed G.I. Joe: Retaliation) from a script by Ryan Landels (who hasn't written anything I've heard of). The "cast" photo to the left was released this week. What do you think? 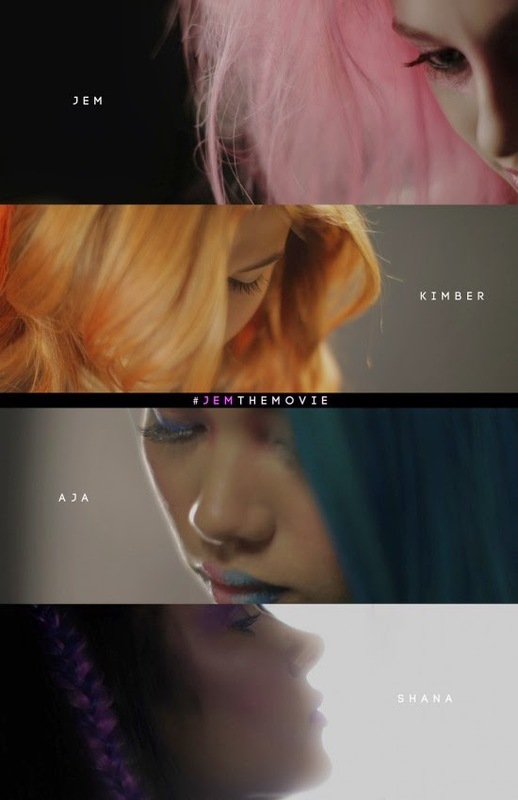 Will Jem's live-action feature bring the kind of "truly outrageous" vibe that the cartoon had for us back in the day? Comment below!